Having recently told you all about my recent visit to Panasonic HQ and becoming a Panasonic Brit Blogger I was excited to receive an email just before Christmas detailing what my first assignment would be. I would be receiving a delivery with not one but two Panasonic items! The Panasonic Smart VIERA TX-L39E6B LED TV and Panasonic SC-HTB20 Sound Bar. We decided that we would treat ourselves and add the TV to our bedroom, currently we have a 32″ TV in there so I was a little worried that a 39″ would feel too over powering. I needed have worried as our current TV is fairly old and has a good two inch surround on the TV compared to the virtual seamless surround on the Panasonic the TV’s side by side were just about the same size however the Panasonic allowed a bigger viewing screen. Setting up was relatively straightforward, after attaching the base (if you are not wall mounting) you simply add the power cord, LAN cable (to enable internet access) and any accompanying products (Blu-Ray/DVD player or sound bars) via HDMI and off you go. Simple even for me who is terrible when it comes to setting technology up. With My Home Screen you can personalise your viewing in a way that’s never been possible before. 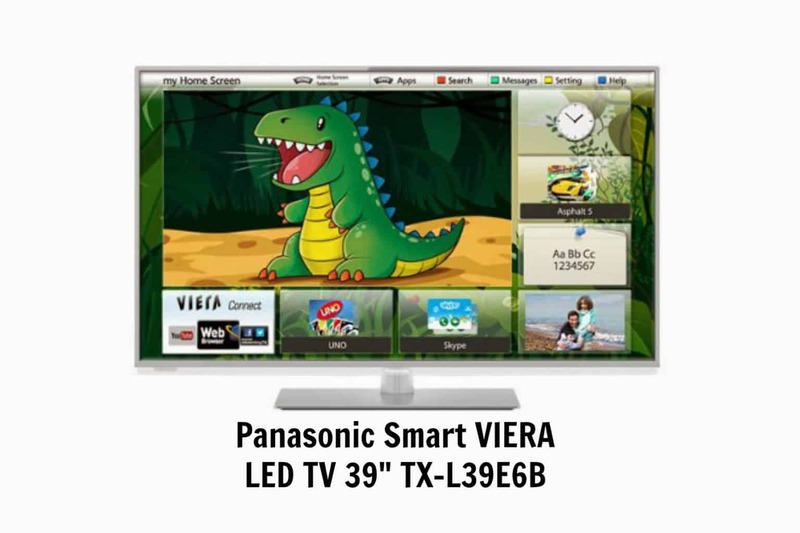 Out of the box, the Panasonic TV offers three My Home Screen presets, themed TV, Lifestyle and Information, each offering relevant content and apps. In addition, you can create your very own My Home Screen based around your own favourite content. This may include BBC iPlayer, YouTube or any of the many other services available from the VIERA Connect portal. The TV has the ability to be controlled from a smartphone or tablet device, using the latest Panasonic remote app (available for iOS and Android). This app mirrors the functionality of the TVs main remote control, allowing you to navigate menus without interrupting the viewing of other family members. And by using Panasonic’s Swipe & Share technology, you can move content to/from your mobile device to a Panasonic TV with a simple gesture – it’s a great way to share photos and video. This TV has been a god send over Christmas as at one point or another we have all been ill so have sent hours holed up in bed. The ability to flick on to our own home screens and find the programmes or on demand that we like to watch has been priceless. Disclosure: I am a Panasonic Brit Blogger, for which I received this item on loan for the purpose of review.